As per ancient vedic texts, by performing this Puja, a person is blessed with good Health, Wealth and Happiness. He gets total security against all kinds of Evil effects and Enemies. Our Ancient Texts and Scripts reveals that “Sri Rudram” is the primeval Vedic hymn of numerous names of Lord Shiva. Various forms of Lord Shiva are invoked and worshipped through the chanting of Sri Rudram. When this chanting is followed by a fire ritual (Yagna), it is called as Rudra Yagna (Homam). 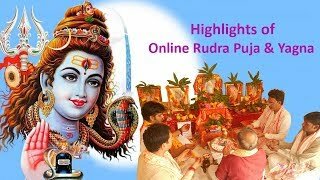 This is one of the most compelling Puja when it comes to seeking the blessings of Lord Shiva for getting relief from any kind of problem. It also helps in getting all the desires fulfilled with Lord Shiva's blessings. By performing this Puja, a person is blessed with good Health, Wealth and Happiness. He gets total security against all kinds of Evil effects and Enemies. His relations with all those who are near and dear to him gets improved and additionally he also gets a peace of mind and observes improvement at a spiritual level. Lord Shiva is the third deity in the Hindu trilogy, in coordination with the other two Lords, Lord Brahma and Vishnu respectively. He is the eradicator of all evil, and the one who bestows the greatest blessings when impressed. The month of Shravan is dedicated to Lord Shiva and by performing this Puja and Homam during this pious period, the performer gets benefited in manifold. Swasti Vachan, Shanti Path, Sankalp, Ganesh Sthapan, Shiva Sthapan, Lakshmi Sthapan, Varun Kalash, Punyaha Vachan, Navgraha Sthapan, Brahma Sthapan, Agni Sthapan, Invocation of all Gods and Goddesses, Navgrah Mantra Jap (1 mala for each planet), One Path of Rudra with Chamkam, Lord Shiva's Abhishek with 108 Bilva Patras (offered as Archan), Homam with Ghee, Sugar, Til, Oats (Jow), Ashtagandh, Sandalwood powder, Navgrah Samidha and then Aarti, Tilak Mantra, Prasad to Brahmins. The exact Date and Timings of Rudra Puja and Yagna will be informed to you through an email and your representatives are most welcome to attend the same. Food or the Anna Daan given to the Brahmins/ Purohits who participates in this pooja. Dakshina or the Fees given to the Brahmins for performing Pooja.